Ohio Valley Christian senior Emily Childers, right, dribbles away from Hannan defender Pamela Ochs during the second half of Friday night’s girls basketball contest in Ashton, W.Va.
ASHTON, W.Va. — A big run when it was needed most. The Hannan girls basketball team broke away from a 13-all tie with a 23-8 surge over the final 10:28 of regulation on Friday night en route to a 36-21 victory over visiting Ohio Valley Christian in a non-conference matchup in Mason County. 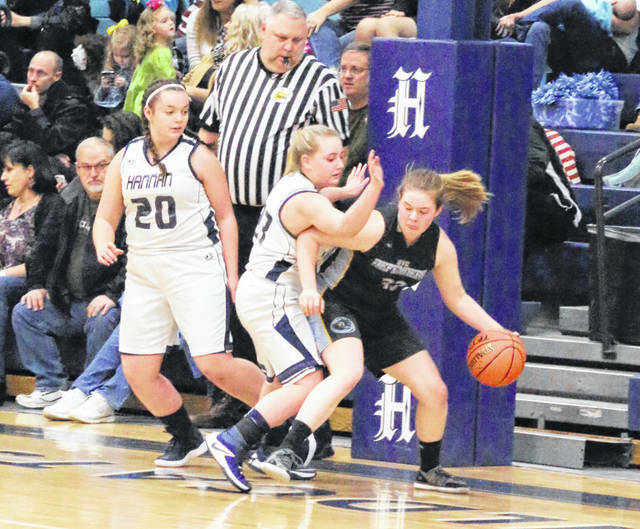 The Lady Cats (2-1) and Lady Defenders found themselves deadlocked at five after one quarter of play, but the hosts responded with an 8-2 second quarter surge that gave HHS a 13-7 intermission advantage. OVCS (3-3) opended the second half with six straight points to knot things up at 13-all, but the guests were never closer the rest of the way. Julie Frazier converted two free throws at the 2:28 mark of the third for a permanent lead at 15-13, and those charity tosses sparked an 11-2 surge that gave Hannan a 24-15 cushion headed into the finale. Both teams traded baskets to keep the lead at nine points just 75 seconds into the fourth, but Hannan rallied with a 9-1 surge over the next three minutes while extending its lead out to 35-18 — the largest advantage of the night. OVCS countered with a 3-1 run over the final 3:04 to wrap up the final 15-point outcome. Frazier led the hosts with a game-high 12 points, followed by Bailey Coleman with 10 points and Kaleigh Sturgeon with eight markers. Josie McCoy was next with three points, while Rachel Ellis and Pamela Ochs respectively completed the winning tally with two points and one point. Leticia Aroujo and Chloe Payne led the Lady Defenders with five points apiece, followed by Kristen Durst with four points and Lalla Hurlow with three markers. Emily Childers and Lauren Ragan completed the OVCS tally with two markers apiece. Hannan returns to action Monday when it travels to Scott for a 6 p.m. contest. Ohio Valley Christian was at Carter Christian on Saturday and returns to the hardwood Friday when it welcomes Ironton Saint Joseph.